Epoxy and Tri-axle fiberglass sandwich a vert-lam Bamboo core, pressed into concave and convex cambers as well as nose and tail kicks. The nose and tails are reinforced with an extra layer of fiberglass for added stiffness and strength without compromising the responsiveness and energy of the central camber. DropThru cutouts are CNC milled for precision. This is the most complex board we've built to date and we hope you will appreciate the subtle beauty of the form. Grip tape: The boards come pregripped with an aggressive black griptape designed to provide maximum coverage while allowing the board to flex naturally. 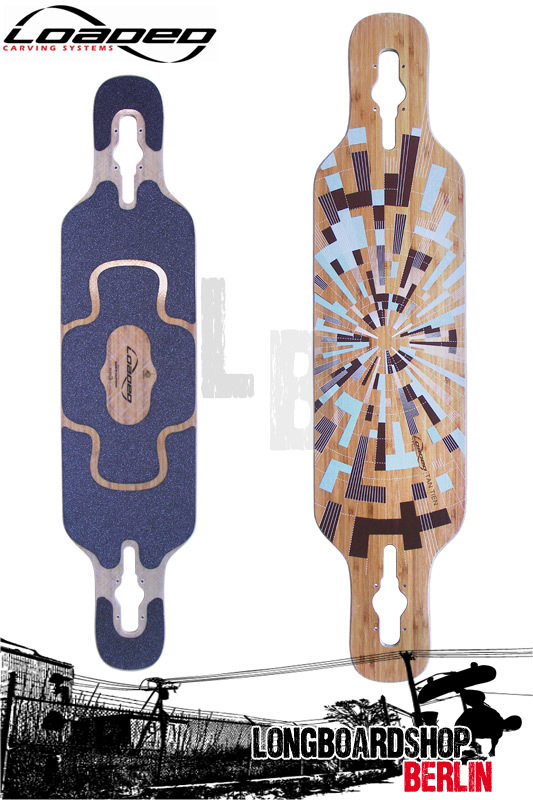 This is our first foray in years into traditional grip tape (albeit grippier to match the needs of this board) and we went with this because it provides enhanced traction and control for sliding and pumping, as well as creating a serious "lock-in" on the nose and tail. We've designed the drop-thru to accommodate the Randal R-II, Paris, Bear, Gullwing Charger and Tracker Fastrack Longboard Trucks. All reverse-kingpin trucks work well on this board, but we recommend using at least a 180mm wide truck.